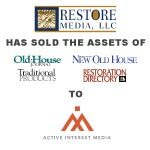 Berkery, Noyes & Co. represents Restore Media, LLC in sale of titles to Active Interest Media - Berkery, Noyes & Co., LLC. New York, July 05, 2007 — Berkery, Noyes & Co., LLC, the leading independent investment bank serving the media, information and technology markets, announces that it represented Washington, DC-based Restore Media, LLC, an integrated media company dedicated to serving the building restoration, renovation, and historically inspired new construction market, in its sale of Old-House Journal and Old-House Journal’s New Old House publications and its affiliated web sites to Active Interest Media. Terms of the transaction were not disclosed. Old-House Journal is the original home-restoration magazine. The bi-monthly magazine provides hands-on information and inspirational stories to those who own older homes with an eye toward renovation and ongoing maintenance and care. Old-House Journal’s New Old House is written for consumers who have a passion for new houses that offer the style, design, and décor of traditional and period architecture. “These brands have found the best home to build upon their strong and loyal audience to grow to the next level,” said Kathleen Y. Thomas, the Managing Director of Berkery, Noyes & Co., LLC who handled the transaction. Active Interest Media is a dynamic media company that serves a base of loyal constituents through print, event and online produces that connect consumers with their passions. The company was formed in October 2003 by Efrem Zimbalist III and the private equity investment firm Wind Point Partners. For more information, visit: www.aimmedia.com.